The above picture shows a Roman relief from the Villa Medici, Académie de France, in Rome, probably known to Berlioz when he was a resident there in 1831-1832 as a Prix de Rome laureate. 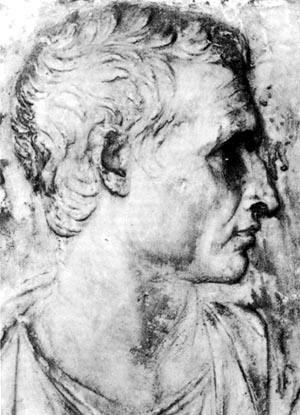 Berlioz read Virgil in the original Latin as a boy as part of his education by his father. His epic opera Les Troyens is, among others, the culmination of his life-long admiration for, and influence of, the Roman poet. The opera is dedicated to Virgil and Princess Carolyne von Sayn-Wittgenstein. 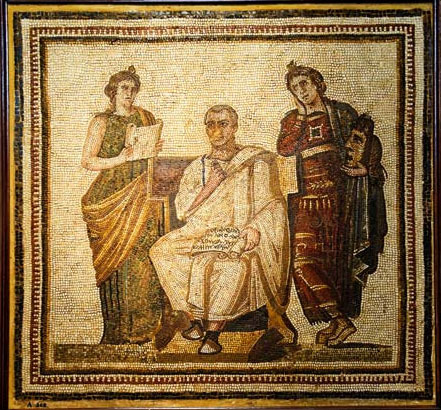 Virgil (centre) holding a scroll with a quotation from the Aeneid and flanked by the muses Clio and Melpomene, mosaic, early 3rd century AD; in the Bardo National Museum, Tunis, Tunisia. The above picture and its description are reproduced here courtesy of Encyclopaedia Britannica. Berlioz discovered Shakespeare when he saw Hamlet and Romeo and Juliet at the Odéon Theatre in Paris. His future wife Harriet Smithson played the title role in both plays. Many of Berlioz’s compositions were inspired by Shakespeare’s plays: Overture La Tempête, which was later incorporated in Lélio, Overture Le Roi Lear, Roméo et Juliette, Marche Funèbre pour la dernière scène d’Hamlet, La Mort d’Ophélie, Béatrice et Bénédict and the Love Duet in act IV of Les Troyens; indeed Berlioz ascribed a major part to Shakespeare’s influence on his epic opera in addition to that of Virgil. The above original 1747 engraving was in our own collection; we have since donnated it to the Musée Hector Berlioz. This cartoon, a copy of which is in our own collection, was published in 1864 in the weekly satirical magazine Punch, known as the London Charivari. The cartoon is by the British illustrator and political cartoonist John Tenniel (1820-1914). 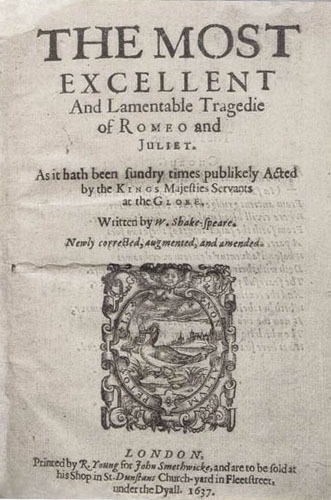 It reflects on continuing anxieties and disagreements regarding the arrangements for the national Shakespeare Tercentenary celebrations, and the erection of a fitting memorial to Shakespeare in London. The above facsimile is in our own collection. 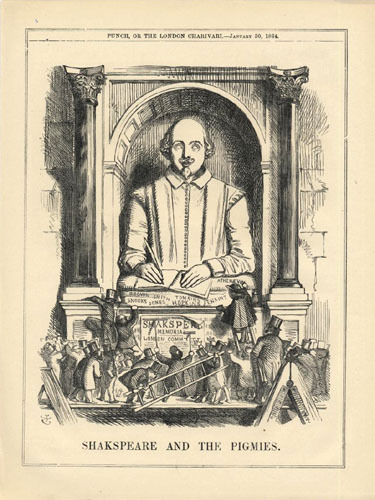 This 1876 engraving, by Charles Cousen (1819 – 1889) after a painting by Arthur Hughes (1832 –1915), was published in London by Virture & Co. It is in our own collection. Berlioz’s 1842 ballade La Mort d’Ophélie and Marche funèbre pour la dernière scène d’Hamlet, composed in 1844, were inspired by Shakespeare’s play Hamlet. 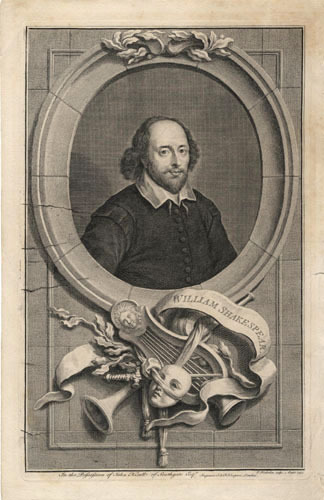 See also in the Photo Album a Portrait of Shakespeare by Haydn Greenway; and elsewhere on the site other works of art inspired by Shakespeare’s plays: Hamlet, Romeo and Juliet, King Lear and The Tempest. Byron was adored by Berlioz and was a major influence on him. He read Byron’s The Corsair [in French translation] when he was in Italy, and inspired his Le Corsaire Overture, which he composed when he was in Nice in 1844. His Childe Harold’s Pilgrimage in particular was an inspiration behind Berlioz’s second symphony, Harold en Italie. Lélio [The Aeolian Harp] was also influenced by Byron. 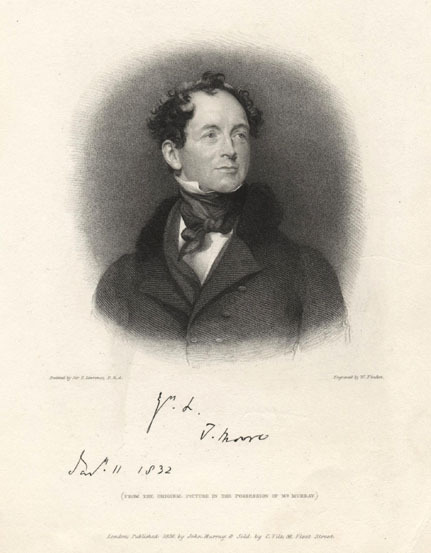 The above 1835 engraving is by W. J. Edwards, after T[homas] Phillips. 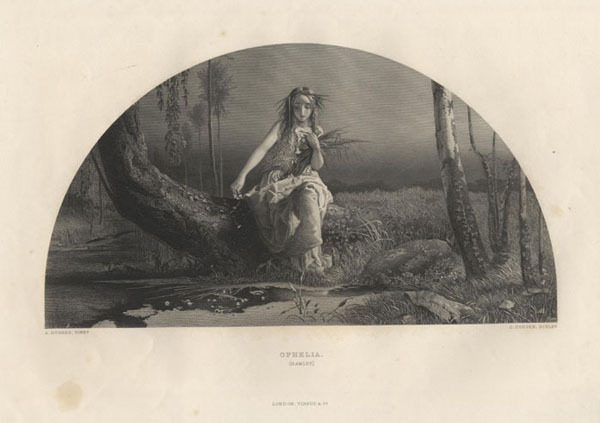 This engraving was in our own collection; we have since donnated it to the Musée Hector Berlioz. 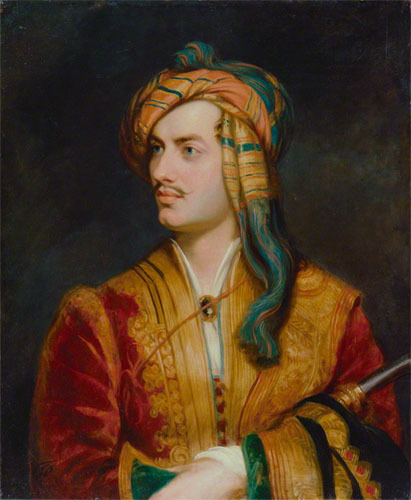 The above replica of painting by Thomas Phillips circa 1835 (1813) shows Byron in Albanian dress; the original copy is in the National Portrait Gallery, London. See also Berlioz and Byron and Gautier on this site. Berlioz had read Moore’s Irish Melodies, Sacred Songs, The Loves of the Angels and A Mélologue upon National Airs (which gave him the idea for Lélio) in French translation, at least to begin with, by his friend Thomas Gounet and others, which came out during the 1820s (David Cairns, The Memoirs of Hector Berlioz,1969, Glossary, pp. 554-555). Berlioz set Irish Melodies to music in 1829, initially called Neuf Mélodies, (later called Irlande). Méditation religieuse (1831 vrsion, now lost, and 1849 version) is also on a prose translation by Louise Belloc of a poem by Moore,“This world is all a fleeting show”. It forms the first number of Trisita. 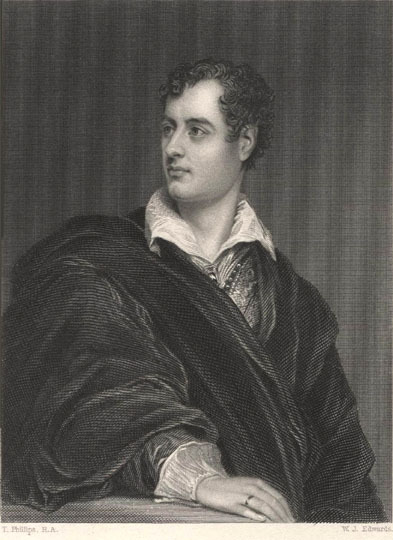 The above portrait was painted by Sir T. Lawrence, P.R.A., engraved by W. Finden, and was signed and dated in 1832; it was published in 1836 in London by John Murray and sold by C. Tilt at 86 Fleet Street. This copy was in our own collection; we have since donnated it to the Musée Hector Berlioz.